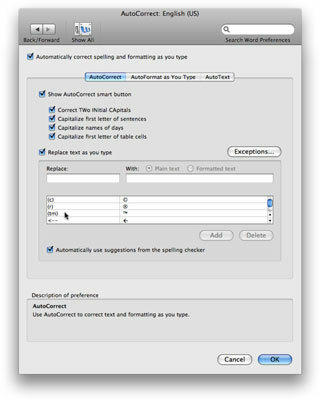 The AutoCorrect feature in Office 2008 for Mac helps guard against common typos. AutoCorrect watches what you type and corrects common mistakes automatically, without bothering you with wavy underlines or dialogs as spell-check does. Choose Word→Preferences (or press Command+comma) and then click the AutoCorrect icon. Either way, you see the AutoCorrect preference pane. If you click the Automatically Correct Spelling and Formatting As You Type check box at the top of this pane, your common mistakes will be corrected automatically as you type. AutoCorrect offers dozens of useful items. For example, if you type (c), Word automatically replaces it with the proper copyright symbol. Or, if you type (r), Word automatically replaces it with the proper registered trademark symbol. You can point at any item in the Replace field under the Replace Text As You Type option to see a description of it at the bottom of the window. If you click OK for an entry, Word automatically replaces it with the text you specified. To add your own automatic replacement pairs, just type what you want replaced in the Replace field and what you want it replaced with in the With field. AutoCorrect is shared among all Office applications except Entourage. Replacement pairs you create in Word are also available in Excel and PowerPoint, and replacement pairs you create in Excel or PowerPoint are also available in Word. To add your own AutoCorrect replacement pairs like these, type the abbreviation in the Replace field, type what you want the abbreviation replaced with in the With field, and then click the Add button. From then on, whenever you type that abbreviation, it is replaced with the word or phrase you typed in the With field.